One of the most challenging messages to convey to patients of any type is the importance of coming in for regular check-ups. Kids don’t like going to the doctor, and neither do most adults if we’re honest. But the truth is that it is essential to good health and longevity. If doctors can spot health issues early on, the chances are greater that they will be able to do something about them before they get out of hand. The same holds true for veterinary care in Massachusetts. 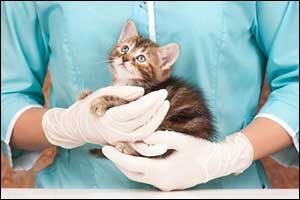 Whether you require vet care for cats and dogs or small animal care, your local animal hospital in Dartmouth can help. While we do offer emergency services, we also provide regular check-ups, vaccinations, and other recommended preventive services. While it might seem like a waste of time to bring a seemingly healthy pet in for a check-up, the truth is that because our pets can’t communicate how they are feeling, it could save their lives. While our domesticated pets have come a long way from their wild ancestors, they still carry a lot of the same traits and behaviors. One example of this is the natural instinct to hide illness or pain. In the wild, an animal that is hurt or sick can be a detriment to a pack or group of other animals. Many times they will abandon or even kill the injured or diseased animal as a means of protecting the family. As a result, animals have become experts at hiding when they are sick or in pain. While there are signs that pet owners can look for, the best idea is to bring them in for regular check-ups. The first check-up for your pet should be to find out how they are doing concerning vaccinations and general health. An adopted pet can come from a shelter, breeder, or another pet owner and that can often mean a cloudy or uncertain background. Your Dartmouth emergency vet can help you get a baseline for your pet’s health, running necessary tests to determine if there are any diseases, injuries, or conditions. This is highly recommended, especially if you have other pets living in your home. You wouldn’t want to bring a sick pet into your house and later find out that your other pets got sick as a result. Your veterinarian at Anchor Animal Hospital in Dartmouth will provide you with suggestions as to the frequency of your pet’s regular check-ups. While most pets can do well with an annual check-up, others may require more frequent visits. Age, health conditions, lifestyle, and species can make a difference. Small animal care is different from general vet care for cats and dogs, so your pet ferret or bunny rabbit may require more frequent or less frequent visits than your dog. Regular visits help your veterinarian to check on your pet’s progress, can assist in diagnosing illnesses, and provide you with nutritional and care advice. If any warning signs occur, such as changes in activity, changes in behavior, changes in eating and drinking, bring your pet in for a check-up right away. It might be nothing, but it could be a subtle indicator of a more severe problem. You can call to schedule an appointment or ask about our Dartmouth emergency vet services. It’s a good idea to have our contact information handy, just in case you need it in a hurry. Our veterinary team can answer any questions that you might have and can help find solutions to a variety of pet problems. To set up an appointment for veterinary care in Massachusetts, contact our team at 508-996-3731. We provide a broad range of services, including vet care for cats and dogs, small animal care, acupuncture and laser therapy, and serve as a local Dartmouth emergency vet. Our family-owned and operated veterinary office has been caring for local pets since 1975.